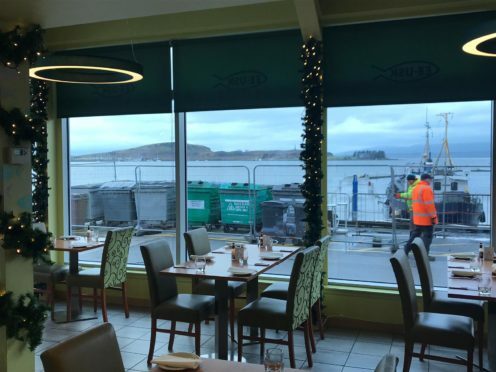 As well as for its fish and shellfish, customers flock to Ee-Usk on Oban’s North Pier for the stunning views across the bay. But yesterday as Oban Winter Festival got underway, around 12 large waste and recycle bins appeared outside the restaurant. The bins were moved there while Argyll and Bute Council carries out pointing work on the North Pier. Callum MacLeod, owner, said: “The council in their wisdom stuck the full weight of the refuse collection for the pier in front of the restaurant windows. “It is a travesty. They could have cordoned off another area in the car park and put them there. But no, they go right in front of the window. They clearly don’t have a clue about tourism or business. Mr MacLeod complained to the council and contacted The Press and Journal yesterday morning, however diners enjoying lunch were treated to a view of the bins. By 2.30pm the council had moved its own bins, which serve the pontoon development and new harbour building. But the glass recycling bins used by the businesses around the pier were still in place. A council spokesman said last night that they would contact the amenity services department with a view to removing the remaining bins completely, or at the very least reducing the number of recycling bins. He added that the grouting and pointing work on the pier was expected to take a couple of weeks to complete. Argyll and Bute Council has invested £3.1million with a new pontoon development, harbour building and maritime visitor centre at the pier. When the pontoon breakwater was installed last year, inspections of the pier revealed that re-pointing work required to be carried out. The pontoons serve visiting yachts and cruise ships and have increased the number of boats visiting the bay. This weekend sees the start of the 10-day winter festival in Oban, which kicks off today with the switching on of the town’s Christmas lights.